johng wrote: Do you hate tv3? Rog. Shaggy. Jeno. No Edfie Butler. What more can i say? Peg Leg wrote: Focking standard definition, focking, fock off ta fock! I presume you're on Saorview? Then rejoice - you aren't even getting a true standard definition picture with the added bonus of a pretty poor bitrate! What? Is it further down the channel list? I watched on 103 and it looked dreadful. Its sky sat. What system do you have - when you say sky sat do you mean a Sky subscription or Freesat on Astra? If its the former, do you have a HD subscription/Box? It's not actually, something to do with TV3 not paying or something. I was in Power City on Sunday afternoon and it was mad looking to see all these giant 4K tellies showing blurry SD footage. Now they have money, they don't want to put their HD channel on Saorview as they are owned by a pay-tv operator. Apropos of nothing, expect TV3, 3E and Be3 to be rebranded Virgin Media 1, 2 and 3 in the near future. If you believe some people Jamie didn't do anything, unseen or otherwise. Sure POM may actually do unseen work but unless the person making this claim is specific about what the nature of the unseen work, then they're bull sh!tting. POM was nowhere near his best against France yet multiple media sources seem to have a hard-on for highlighting how important his contribution was around the park. I haven't really seen such a response from the media to what was a fairly average performance by his own standards. Its strange to see. I'd be a fan of POM when he's at his best. He wasn't at his best. A lot of Irish players weren't at their best. Also, Keith Earls catch of the cross field kick. Sexton kicked the ball to him, he ran forward, jumped about 2 feet in the air and caught it uncontested. It was brilliant to watch but lets not make it something it wasn't. The way some people are describing it, you'd swear Earls was floating. Firstly, Johnny played very deep after the first quarter, not taking it to the line. This may be because he saw us controlling the game 2:1 in terms of territory and possession and the scoreboard was moving in the right direction...albeit slowly. Was he avoiding risky play on a slippy day and/or avoiding being targeted and thereby maximising his chances of playing more of the Championship? Secondly, we have a problem in our back row with POM and CJ. They are out of form but to Joe's thinking they are sacred cows with Seanie and Jamie off the scene. Moreover they are increasingly outmoded as neither offer continuity on the ball. Our front 5 players are better distributors - think Furlong, Hendy, James Ryan and Healy - who had a lovely reverse pass out the back of his right hand on Saturday. POM is an institution in the eyes of many. An Munster Captain and potential Captain of Ireland and Captain of the Lions for some big games last year. He is also more important now to Ireland (in lineout terms) without Dev in the team. He had 6 of the 11 Irish lineouts last weekend, but I am sure that we could plan to be spread throws around more with Leavy/Jordi able to take at least 4 in a game and James Ryan and Ian Henderson capable of more than 2 a piece. Stander carried the most of any Irish player with 25 of 184 Irish carries for an average of 1.5 metres per carry and no offloads....where is that taking us? The next breed of #8s are lining up and they are much more like Kieran Read as athletic, rangy ballers with great footwork and hands...Simmons, Zac Mercer, Jack Conan and Max Deegan. They have done us some service alright, but we won't get to a RWC SF with old-fashioned players like POM and CJ allied to the sort of blunt backline attack we now have. We need to evolve quickly towards RWC2019 and this Italy game is a great opportunity to work towards that (along with Oz in the summer and the AIs. 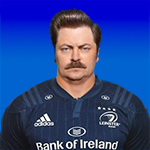 So I would love to see Conan come in for CJ with POM (lineout continuity) and Leavy completing the back-row. Then Larmour at 15, persist with Stockdale (especially as it is Italy) and bring Joey on for Johnny after 40 minutes. Ultimate Rugby's player ratings gave everyone in the pack 7/10 except for James Ryan who got a 6!! Also claimed Henderson had a quiet afternoon and POM was "Impressive in attack, ran intelligent lines and carried effectively when called upon"
johng wrote: [quote="Peg Leg"]Focking standard definition, focking, fock off ta fock! Is sky one in HD or SD, also, whats on channel 273 (which is where TV3 SD is located on my Sky box) on your box? Sky one, rte2, bbc etc. are HD. I thought people were wrong when they criticised Heaslip for his lack of metres on carries and I think they are wrong about Stander too. Stander is willing and usually available to take on and mop up an abundance amount of slow shite ball just like Heaslip did. Someone with that work rate and appetite is invaluable imo. I take your point about the no off loads but if he started throwing around the pill particularly in a game like Saturdays he would quickly be out of a Joe Schmidt coached team. The issue you have might be more about Schmidt then the players selected. I somewhat agree with this. But I think there's an element of the players involved. Stander’s workrate was enormous last week. I thought he was quiet for first half, but having re-watched the game he did a lot of heavy close in carrying and setting up poor ball. A very similar role to Heaslip. His ruck workrate was fantastic too. You can't take 25 carries and 1.5 metres per carry in isolation and say it's poor play. It might be good play from Stander actually because many of those carries might be close in, and he may be carrying so much to pick up the slack for others too. While he could improve on the passing/handling front, and in fairness he has been with Munster to a degree, and his footwork, I think the big issue here isn’t CJ particularly (albeit I still don't think he's a top class international 8, but a very good test 6), it’s our 6&7 at the moment imo. POM and JVDF are not a good carrying pairing at test level. Leavy added a lot when he came and should keep his place. SOB is a huge loss though. His ability to pick lines and burst tackles is almost unparalleled in the squad. Also, Healy and particularly Furlong were well below par when it comes to carrying last week. Would expect big Tadhg to come back into form a bit in the Aviva. According to Murray K, Conan is coming in this week. He should be able to make a lot of yards against Italy too. Stander carried the most of any Irish player with 25 of 184 Irish carries for an average of 1.5 metres per carry and no offloads....where is that taking us? The next breed of #8s are lining up and they are much more like Jamie Heaslip as athletic, rangy ballers with great footwork and hands...Simmons, Zac Mercer, Jack Conan and Max Deegan. wixfjord wrote: I somewhat agree with this. But I think there's an element of the players involved. A lot of the poorish carrying was down to Murray's slow delivery. This can be a chicken and egg situation but in some instances it was definitely Murray's fault. The incident where we were 10m from the French line and Murray took so long to pass to Furlong that Furlong got turned over, conceded a peno and France ultimately got 3 points as a result, being a case in point.